Our sister project AMaTUC, coordinated by the Technical University of Cluj-Napoca (TUCN), organised a summer school the 10-15 September 2018. During this event, the partners Loughborough University, FH Aachen and Intelligentsia Consultants had the chance to meet a participant from the partnering company Guhring, located near TUCN's premises. We are extremely lucky to have AMaTUC and DiCoMI projects running at the same time so we can utilise our time in Romania to meet and discuss with our partners. Unfortunately, the DiCoMI partner Fibrex did not attended the summer school in Cluj-Napoca due to long distance and the low number of scientific staff that could benefit from the summer schools lectures. 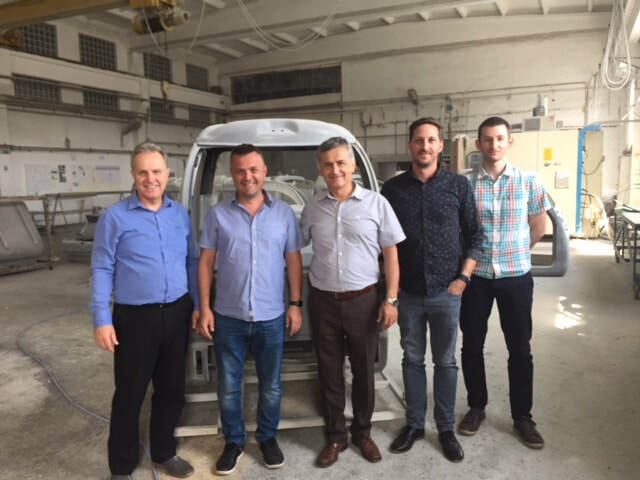 As a results, we organised a visit to Fibrex with representatives from the Technical University of Cluj-Napoca (TUCN), Loughborough University (LbU) and Intelligentsia Consultants (ICL). Fibrex company is mainly involved in the design, development and production of bathtubs, spa and pools for the Romanian and European markets. Moreover, they are the specialist for innovative and new fibre glass products for industrial and domestic use. Their recognised expertise and innovation capacity in plastic thermoforming, composite moulds production and GRP products manufacturing allow Fibrex to be the supplier for companies such as Michelin, Emerson, SFL Technology, Leroy Merlin, Bricodepot and Praktiker. The DiCoMI delegation visited Fibrex factory located in Crasna (Romania), the afternoon of the 11th of September 2018. Our host, Mr. Adrian Pop warmly welcomed the delegation and organised a factory tour in addition to technical discussions on DiCoMI objectives, activities and secondment plan. The visit was highly appreciated by all the participants while the discussion led to concrete ideas and plans for the DiCoMI implementation. One of the direct results of the visit was the identification of a composite part produced by Fibrex which could be used by the DiCoMI project to develop demonstration components. 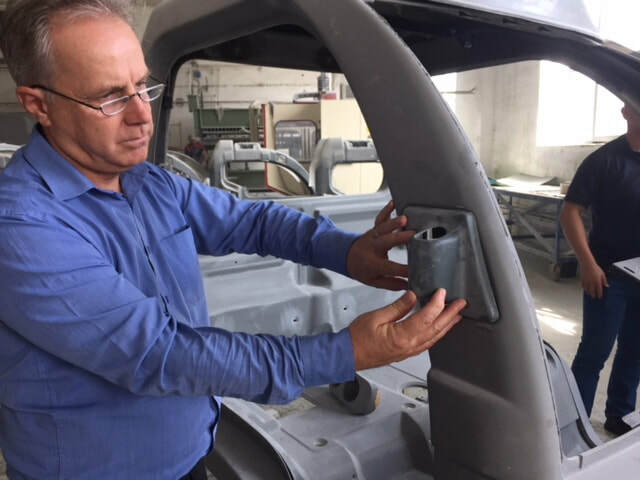 The DiCoMI coordinator, Prof. Campbell, analysing the composite parts of a car under development at Fibrex.